[Arthur Benemann] has the worst part of making coffee licked. 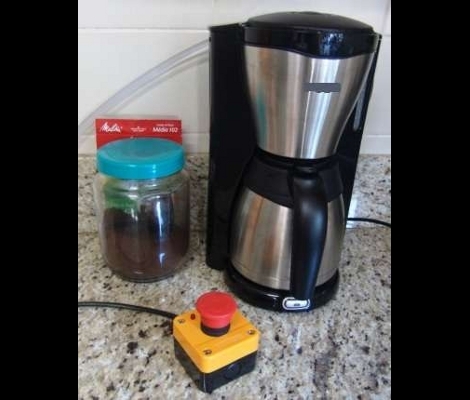 His add-on for a drip coffee maker fills the water to the proper levels for you, saving the drudgery of rinsing out the carafe, carefully filling it to the appropriate level, then pouring it into the machine without getting everything wet. This isn’t limited to a full pot, but is user selectable by the cup based on how many times in a row you hit that red button. One LED gives feedback on the selected mode, then the device uses a washing machine water valve to turn on the tap for the appropriate amount of time. We’re a little bit leery of connecting homebrew hardware to the water pipes in our house. Make sure you’ve done a good job of debugging so that an infinite loop doesn’t flood you out. erm, you meant does NOT flood you out, right? Cool hack, now add on bean grinder and grounds replacement system. @isama: It could go in the contest too! So, pouring water into an auto drip coffee maker really isn’t the end of the world. However, that shouldn’t stop you from making this project. It looks fun. But, I will say this is far from a water “dosing” system. The only control you have on how much water you get is fixed time intervals. There is no compensation for pressure thus a volume cannot be deterministically produced. That said, it is probably accurate enough for a pot of coffee that I just eyeball. There is just something in my brain about the implied accuracy of digital electronics. I was thinking that you could use photosensors to determine the level of liquid in the pot. I have a pot with a floating ball for level indicator; it would break the beam. It should be easy to set up a series of photosensors at “1 cup” intervals to determine when the level passes one. Add a timeout circuit to prevent flooding. Oh, and definitely go ROHS build for anything food related. “dosing” isn’t really the right term here. I use a dosing pump to maintain the salinity of my saltwater aquarium- it moves a predictable amount of water in a given period of time, and I have redundant float switches to prevent flooding. Sparkfun has a fun water level sensor in the form of a thin strip of plastic- would be easy to use that to monitor the water level to make something like this a closed system. Still, fun project, and kudos for the creativity. I really like simple user interfaces. Do you want one cup? Hit once. Two, twice. You want 21 cups? Just hit 21 times (yes, I know, I just wanted to mention this). Another idea. Mount the button on the wall and hide the wire or make it wireless so you could hit it on the sofa. What keeps bacteria at bay aside from the heater elements? Counting time will not give you an accurate amount of water. The pressure, and therefore flow rate, changes drastically in the pipes in your home from min to min. I hope has an overfill relief valve in case he starts the machine with water in the system or the valve malfunctions. Just make your damn coffee yourself like people have done for over 500 years. I was once thinking down this same path, but I discovered no dumping the old water and rinsing from time to time, makes for a nice algae tank to drink from. The water tank needs to be sealed to the air. Or better yet, a direct feed of water into the system. Keeping in mind the need for backflow prevention. Peristaltic or magnetic metering pumps give you true metering ability, but can be pricey. Hi guys, i enjoy that you liked :). I thought about putting some sensors to measure the water levels, but then i would’t be so simple. A timeout isn’t needed as water it already do it to fill the cups. The pressure doesn’t seem to be a problem, i don’t know how your water system is, but mine was a has a water tank on the roof (i don’t think i’m making any sense). So unless someone uses the toilet, pressure is constant enough to make the correct measurements. The body text for this reminded me of an infomercial. “Just can’t get the water into the coffee machine? Tired of drenching your clothes and your pets? This is really interesting, though, and I can’t think of a time when I wouldn’t like superfluos automation.. I have that exact same E stop button! Great button!